A little retrofitting with new hooks on your lures could mean a difference in the number of fish you catch. Changing the factory hooks on your hard baits is an easy way to tweak your lure’s performance — and put more bass in the box. You buy a bait, remove it from the packaging, tie it to your line and make a cast. Everything should work as expected, right? Yeah, that’s generally how it goes; and as long as you’re selecting reputable products, you should expect reasonable teamwork between the piece that attracts a fish and the piece(s) that make them regret their mistake. But that’s the standard deal — baits and hooks matched by the manufacturer for a predetermined performance. Nothing wrong with sticking to the playbook, but the savvy angler keeps his/her options open; and by that, we mean hard bait hook changes. Indeed, crankbaits, jerkbaits and topwaters all arrive ready to play; but you’ll be pleasantly surprised at what a little retrofitting can accomplish. Options are many, but let’s outline some of the key considerations. All treble hook baits carry a fish-loss risk, but strategic hook choice can alleviate this problem. Going lighter or heavier on hooks influences sink rates and that’s particularly significant with jerkbaits. Perhaps you need that slow sinker to descend a little more slowly, or suspend for lethargic winter bass; maybe your suspending bait needs to reach a couple of feet deeper. Bassmaster Elite pro Mike McClelland likes his namesake Spro McStick 110 for prespawn bass, but he finds the 115 floater/diver appeals to territorial females advancing closer to the nesting zone. The key here, McClelland says, is swapping the bait’s standard No. 5 Gamakatsu trebles with 2X No. 4s, which transform the bait’s action into a nearly suspending posture that allows him to fish the larger profile bait slowly through a targeted area. FLW regional pro Phil Marks wants to make sure his Strike King crankbaits securely hold whatever bites, so he always goes one to two sizes larger on his trebles. 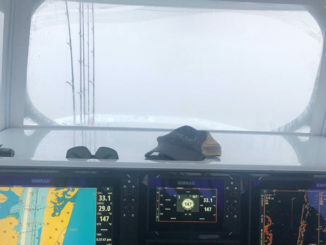 This, he says, achieves a bigger “bite” (distance from hook point to the bend) with which to grip his fish. Also important to Marks are 2x strong trebles, which don’t flex with the big’ns. Elite pro John Crews also values upsized hooks, but he points out that saddling a lure with too much weight can adversely affect its action. Hook size and wire gauge are subject to the laws of physics, so Crews tests his altered models in a swimming pool. Clear lake water will also work, so wind your bait past your position to make sure you haven’t dramatically changed the performance. 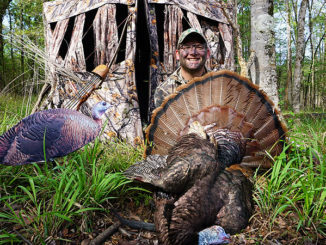 Your hook change options include feathered trebles. Because manufacturers select stock hooks based primarily on bait size, substituting larger hooks can cause proximity issues. In other words — swinging trebles can grab one another, mar your presentation and practically nullify your hooking potential. 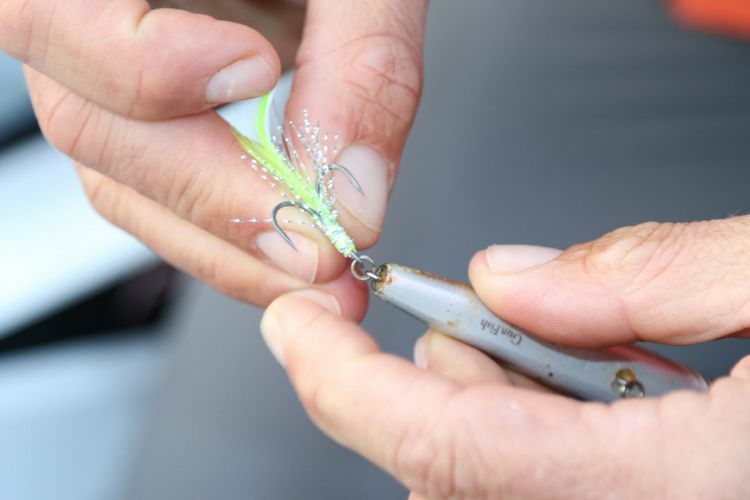 An easy fix — use short shank treble hooks because they allow you to upsize your hard bait hooks without worrying about them catching one another by swinging together. Crankbaits are inherently a motion-oriented option and the degree of side-to-side wobble should be matched to the scenario. Case in point: Elite Pro Russ Lane’s adjustment to a Spro FatPapa 55 squarebill. Casey Ashley likes red hooks because they give fish a target point. You might think that a topwater lure, whether it’s a big walking bait like the One Knocker Spook or a concave face popper like the Rebel Zell Pop, attracts all the attention necessary for tempting a bass — and you would not be wrong. However, an overzealous bass often misjudges its skyward assault and misses the bait. Red Hooks – Elite pro Casey Ashley always rigs a crimson treble in the front position of a 2-hook bait, or the middle spot on a 3-hook model. His belief is that the extra color gives the fish a targeting point that brings their mouth closer to the hooks. 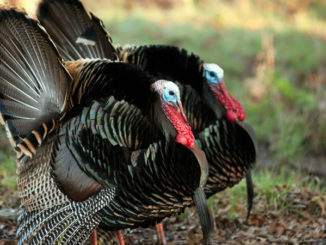 Dressed Hooks – There’s a lot of angler-catching gimmicks in the fishing industry, but feathered trebles are not among them. These accent pieces give the bait a lifelike “breathing” action that followers can’t stand. Contracting when pulled and expanding/flaring when paused, these accents tease and taunt a fish into biting. 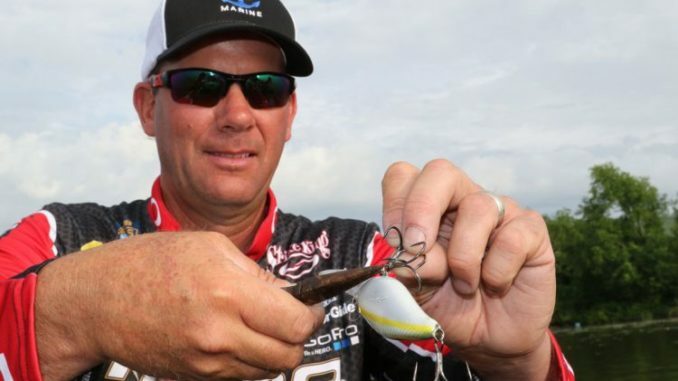 And according to FLW pro Scott Suggs, a feathered treble can actually improve the physics of a hook-up: As he notes, when a fish comes up to eat a topwater, the surge of water can actually push the bait out of the way and cause the fish to miss it. A dressed hook’s feathers create drag on the bait and sometimes, that’s just enough to allow a fish to “get” it. The flex of a parabolic rod absorbs initial strike force and allows treble hooks time to set. Now, with all of these considerations, we can’t overlook the importance of sticking those hooks and keeping your fish buttoned up. Crews knows this well and tells us that he’ll select his hooks based on objectives. “You need to know when you need more penetration,” Crews said. 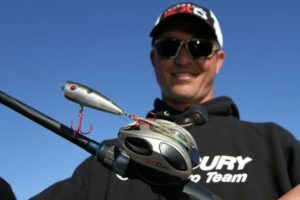 “Round bend trebles have more penetration so they are better when the bass’ mouth is a little harder, as in colder water. 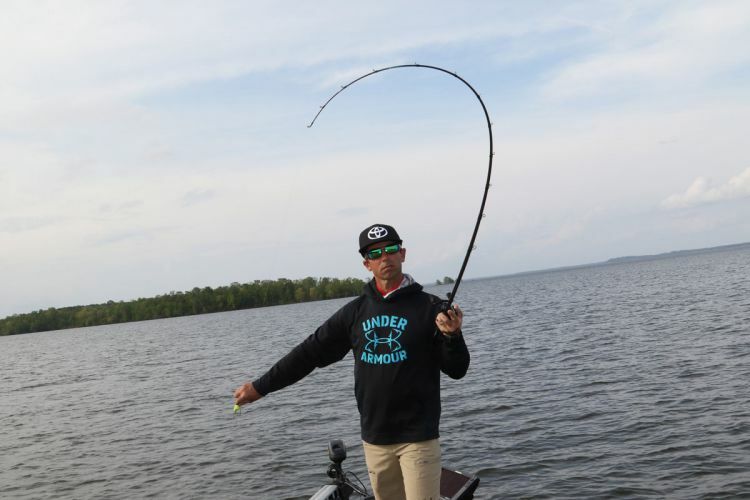 Elite pro Brent Ehrler’s also a round-bend fan, especially for topwaters and jerkbaits. 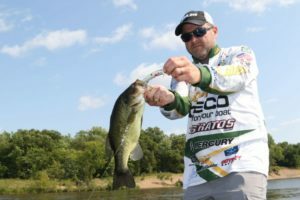 These two lure types often showcase a bass’ tendency toward indecision, so dealing with “short strikes” can become a lingering frustration. If you’re missing too many strikes, or dropping too many hooked fish, you might need to consider a rod change. 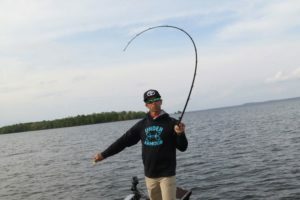 The common mistake anglers make is using a rod that’s too stiff — one that either yanks a bait away from a biting fish, or imparts such force during the fight that hooks rip loose. Everyone has their preferences on length, handle design, etc., but if you’re suffering from opportunities lost, drop down to a softer rod; maybe even a parabolic action. In simplest terms, the more shock your rod can absorb, the more time a fish has to close its mouth around the bait. And during the fight, that softer action will do all the fish-whipping work for you, while minimizing the risk of “dumping” one. Keep in mind that stock hook sourcing is often price point related. Other words, some manufacturers forgo top-shelf hooks to maintain their retail appeal. That’s not always the case, but personal experience will guide your decisions. But even if you’re happy with a lure’s hook quality, remember that a broad range of performance-enhancing opportunity awaits those willing to crack open a split ring.